Jaime Stephens, Klamath Bird Observatory Science Director, was recently interviewed on the Jefferson Exchange. 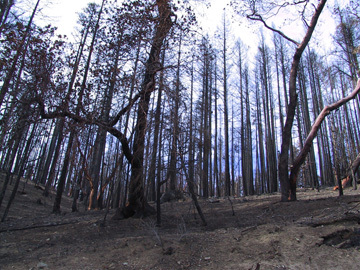 She shared results from a recently published study that found fire severity and the number of years post fire were both critical to unveiling potential benefits for birds. You can listen to the full Jefferson Exchange broadcast online by clicking here. To learn more about this study an d the results found click here and read the full press release or view the full paper published in The Condor: Ornithological Applications. The distributions of species described in the paper illustrate conceptual and spatial domains for natural areas management that provide an eco-regional framework for collaborative conservation. The paper describes a Maritime Management Domain in the western portion of the Region that is similar to other coastal areas. To the east, a Great Basin Domain that is similar to other Great Basin environments is also described. While conservation management approaches that have been tested in other areas of the west coast and Great Basin may be effectively applied in these two Domains, a third Eastern Klamath Management Domain, at the core of the Klamath Region, is more unique and presents novel management challenges. This third Domain has higher species richness and endemism than other environments in the western United States that are climatically similar, such as the southwest. Because the area is so unique, management approaches that have been successful in other areas may not be as easily applied in the Eastern Klamath Management Domain. Lead author Daniel Sarr explains further, “Because of its exceptional spatial complexity, it has not always been clear how management concepts and approaches developed in other areas of the West can best be used in the Klamath Region.” However, the species that characterize the Eastern Klamath Domain may be the key to the conservation and management of natural areas in the Klamath Region. The Klamath Region will likely serve as an important refugia for a number of at-risk species that may become more threatened by climate change. Therefore management intended to help the Region’s unique array of native species persist into an uncertain future is becoming a priority. 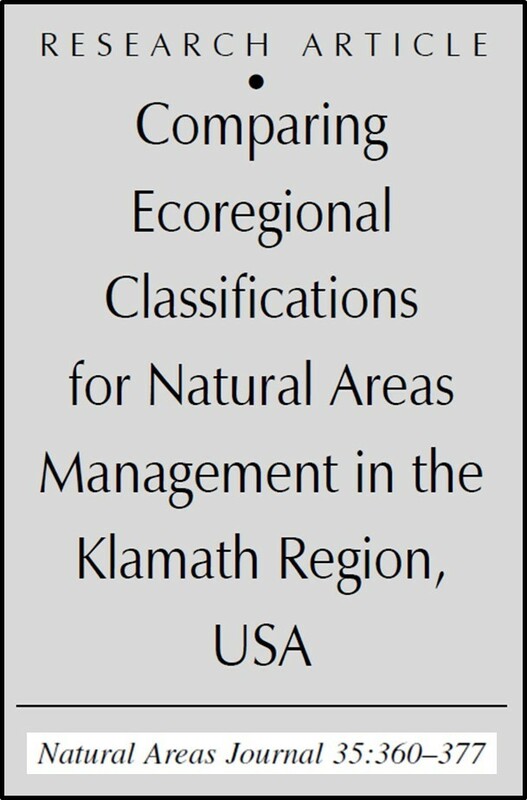 This paper presents an improved understanding of how such species are distributed across the region which, in combination with knowledge about the species’ habitat needs, can help inform design of the novel management approaches that may be needed in the Klamath Region. 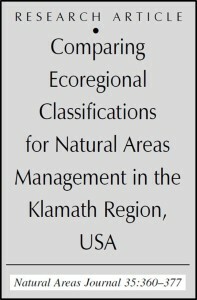 To access a copy of this new publication, Comparing Ecoregional Classifications for Natural Areas Management in the Klamath Region, USA in the Natural Areas Journal contact John Alexander (jda[AT]KlamathBird.org, 541-890-7067) or click here. Click here to view a PDF of this Science Brief and News Release. 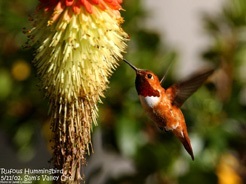 Klamath Bird Observatory, based in Ashland, Oregon, advances bird and habitat conservation through science, education, and partnerships. Klamath Bird Observatory is fueled by partner-driven science programs. We use birds as indicators of the healthy and resilient ecosystems on which we all depend. Our science involves three integrated aspects: 1) long-term monitoring, 2) theoretical research, and 3) applied ecology. We bring our results to bear through science delivery involving partnership driven engagement in conservation planning, informing the critical decisions being made today that will have lasting influences on the health of our natural resources well into the future. Klamath Bird Observatory’s award-winning model was developed in the ruggedly beautiful and wildlife-rich Klamath-Siskiyou Bioregion. We now apply this model more broadly throughout the Pacific Northwest. Plus, our intensive professional education and international capacity building programs expand our influence into Mexico, Central and South America, and the Caribbean. Habitat alteration due to forest clearing and climate change threaten wildlife populations across the globe. To better understand the interacting effects of habitat degradation and climate on bird populations, researchers from the U.S. Forest Service Pacific Southwest Research Station (PSW), Klamath Bird Observatory, and Costa Rica Bird Observatories spent 12 years studying the White-collared Manakin, a fruit-eating tropical bird, in mature and young forests along the Caribbean coast of Costa Rica. 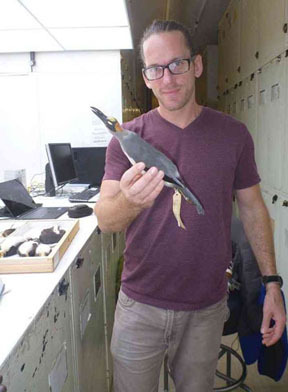 During the study, several El Niño and La Niña events—cycles of warm and cold ocean temperatures that influence air temperature and precipitation—resulted in very marked dry and wet annual conditions that allowed researchers to measure differences in manakin survival relative to climatic shifts. 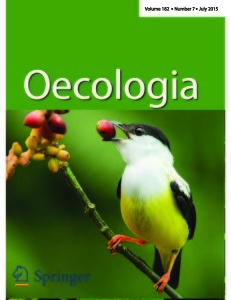 Results were recently published as the cover article in the journal Oecologia July 2015 edition. In young tropical forests, researchers found dramatic decreases in manakins’ survival during dry weather associated with El Niño. Researchers believe that, due to a sparser canopy and their fragmented nature, the young forests were more susceptible to understory drying that reduced fruit production. Conversely, manakins’ survival rates were higher during wet years associated with La Niña events in these young forests where increased moisture and sun exposure likely led to an abundance of fruit resources. In mature forests, researchers observed very stable manakin survival rates regardless of climatic shifts, suggesting a relatively constant abundance of fruit resources. These study results represent the first published documentation of El Niño’s influence on the survival of a resident tropical landbird. Researchers believe that variation in manakin survival between forest types provides insight into the sensitivity of certain species to habitat alteration. “From a management perspective, understanding how climatic events affect biodiversity is critical for the development of science-based conservation strategies,” says Pablo Elizondo, the Costa Rica Bird Observatories’ executive director and co-author of the study. 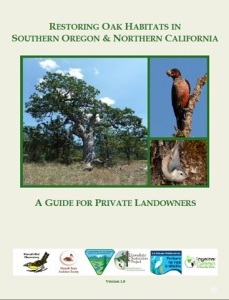 This publication represents an ongoing collaboration between Klamath Bird Observatory, the US Forest Service Pacific Southwest Research Station and International Programs, and the Costa Rica Bird Observatories. 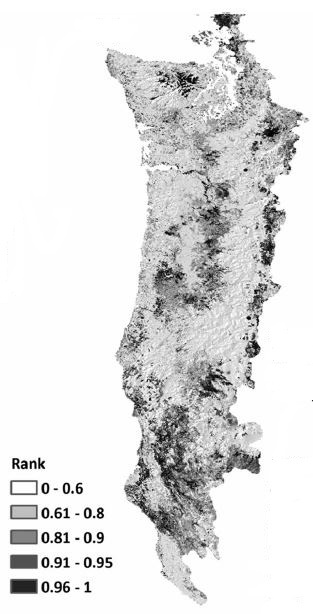 To view the Oecologia paper click here. Click here to view a pdf of this science brief and news release.